And if you're not on facebook. Quote: Win a Glock 19! The American Gun Owners Alliance wants you to be the most informed gun enthusiast around, so much so that we are giving away a Gen 4 Glock 19 just for signing up with us! 1. Sign up at our site http://amgoa.org/Member-Signup using either the regular sign up form or the sign up with Facebook form. 2. Once you have signed up log into your member control panel and complete your contact information; address, city, state, area code and phone number so we can contact you if you win. Member must also enter their birth date to confirm eligibility. 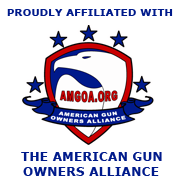 Then like our Facebook page at: https://www.facebook.com/AmericanGunOwnersAlliance to see if you win (announcement will also be made on the website for non Facebook users). Winner will be chosen by a script that will select a random member id from our database on August 1, 2013 and will be announced on Facebook as well as the AMGOA website. Already a member? Don't worry you will be included in the eligible members, just pass this along to a friend. Is AMGOA a formally established non-profit? If so, what type? gnbrotz;94028 Wrote: Is AMGOA a formally established non-profit? If so, what type? We added a new feature to the site yesterday, FFL reviews. You can add your positive (and negative) experiences with an FFL by locating them from our locate FFL page: http://amgoa.org/Federal-Firearm-Licensed-Dealers and then click on the link below their information that says 'Review this FFL'. We do require membership (again 100% free) And reviewers to be logged in to add reviews, keeps the spammers and idiots from posting garbage. dc dalton;103949 Wrote: We added a new feature to the site yesterday, FFL reviews. You can add your positive (and negative) experiences with an FFL by locating them from our locate FFL page: http://amgoa.org/Federal-Firearm-Licensed-Dealers and then click on the link below their information that says 'Review this FFL'. Added another new feature to the site, gun show reviews. How this works is the reviews 'stick' with any show run by x promoter at y venue. In other words if you went to a show last month and the promoter has a show at the same place next month you can add a review and it will 'follow' that promoter / show combination for all upcoming shows. An example of a review I wrote about the Split Rock show (Eagle Arms) is linked below. So as long as Eagle Arms keeps doing a show at Split Rock this review (and any other added) will be there. As with the FFL reviews you must be a member and be logged into the system to add a review but anyone can read them. We just found (and fixed) a bug in the system. If you have laws on your watch list and had set your preferences in your control panel to be emailed when the laws were updated please log back into your control panel and update your preferences again. There was a problem in the back end code that was setting the email updates field to false no matter what you chose... sorry about the problem. Bumping this thread for those who missed it. Information is added daily; don't miss it! Our new gun giveaway starts January 1st, 2014. This time the winner gets to pick the gun they want from our list.